“Do you think they missed him terribly when he fell? 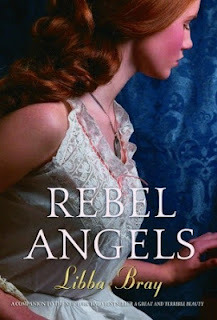 *Sigh* So I just finished Rebel Angels last night and I cannot stop thinking about it! As I've said before I am an absolute historical geek! I love the descriptions of the dresses, the gloves, the balls, the men in white ties and tails, everything and anything about a different time period I just eat up and the second installment of the Gemma Doyle series does not disappoint. The story picks up with a prologue by Kartik meeting with the Rakshana, the secret male society that protects the realms, and they give him a mission: Help Gemma bind the magic to the Rakshaha and...well, you'll have to read to find out the second part of his mission :) After that we meet back up with Gemma, Felicity and Ann who travel from Spence to spend the holiday in London. They return to the realms to try and find the Temple where Gemma can bind the magic. They find Pip, explore other parts of the realms and try to decide whether to trust the new teacher from school Miss McCleathy. They also reacquaint themselves with Miss Moore and try to get her opinion on things. The novel also explores the customs of the age with suitors coming to call on Gemma, Christmas balls, and all the etiquette that goes along with it. I'll take my corset and gown any day now...thanks. I loved reading this book. Objectively I would say this story is a bit slow moving but to be perfectly honest, it is rare that I truly enjoy the ebb and flow of a book. Usually one is reading to get to the end to see what happens but the story that Bray weaves is one that I am content just to enjoy and go along for the ride. I loved reading about the everyday customs of the girls of this time. Having to have a permission in order to call upon a friend. Needing a chaperone in order to even talk with a boy. Filling out a dance card at a ball. It is all just so different from our customs now I find this all fascinating. I really just loved reading about Gemma's life and what she was doing. I also really liked how Bray lays an underlying theme of women's rights and objecting the female customs of the times. Gemma follows all the rules and knows what is "proper" but she also very sly and subtle when going against the grain on some things. She recognizes that women do not really have a lot choice in their lives and she encourages Ann especially to fight against the circumstances she was born into. She wants to make her own fate and destiny and choices and I LOVE this about her character. Gemma is growing up and starting to see that she does not necessarily have to follow the status quo. She wants to be able to choose her destiny. Love love love! Now! On to the magic! Besides the normal stuff the girls were doing the realms sections of the book were amazing. We get to meet multiple new characters and species if you will that exist in the realms. It is such a magical and fantastic place with so many layers and facets that the garden is really just the beginning. The plot continues to twist and turn and keep you guessing throughout the novel. Just when you think you have something figured out Bray throws something else at you and flips the whole story upside down. It is great. Overall, Rebel Angels is fantastic. The continuing story keeps you interested and guessing and wanting more all at the same time. If you haven't read A Great and Terrible Beauty you need to start.